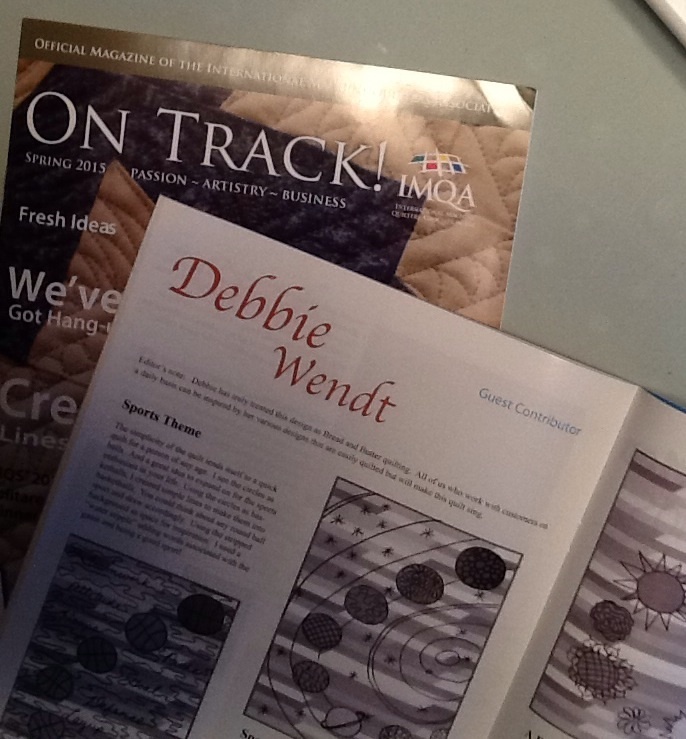 I am the guest contributor for “Fresh Ideas” quilting section in ON TRACK! for IMQA’s magazine. (International Machine Quilters Association). I was given a quilt image designed by Pat Harrison and asked to give quilting ideas for the quilt. Pat did a quick Jelly Roll quilt and added circles. Oh, the possibilities! I won’t “tell all” but my first idea was bouncing balls, so I turned the circles into basketballs with inspirational words in the background. I like doing non-gender themes….it doesn’t always have to be feathers and flowers…..ya know boys like quilts too! I also saw the solar system. I had fun putting my thoughts on paper. I have talked about quilting ideas and inspiration in previous posts. This brought it full circle with putting ideas on paper and now to have my quilting ideas published!! There must be a tip in there somewhere….?!? 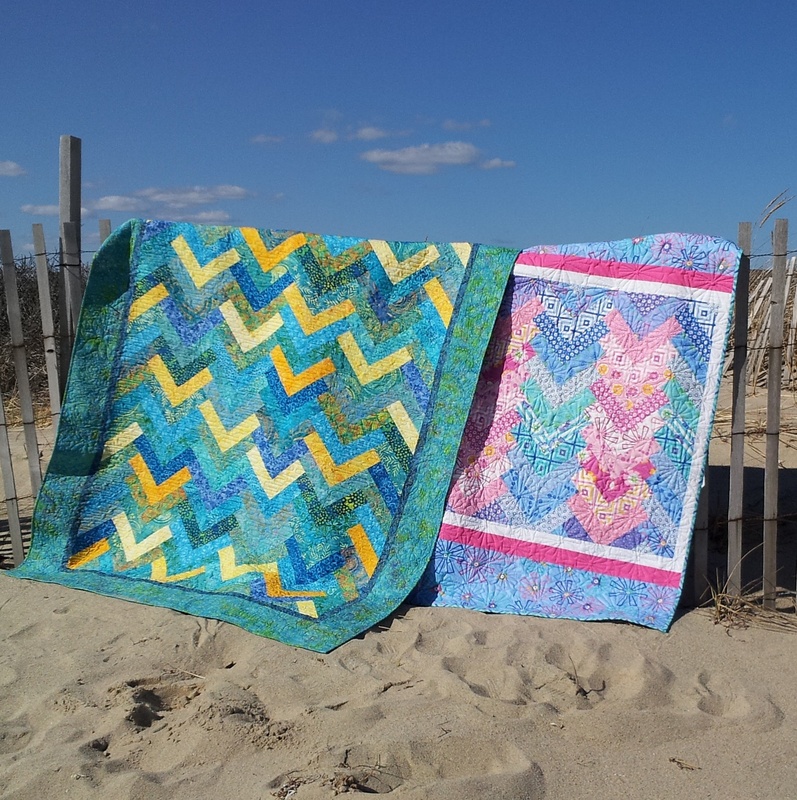 Next week is Spring Quilt Market!! I am knee deep in samples and computer work for my three new patterns! I gave you a sneak peak at the corner of one of the quilts several weeks ago. Now the big reveal of the cover photo…. I am so thrilled with this unique braid quilt! It is like an original braid quilt with color variations. It is usually called a Prairie Braid. I have turned it into a Brilliant Bindings pattern! And given it the name Brilliant Braid !! It has two very unique looks using the exact same layout. It is all about where you put like colors. These quilts use 2 1/2″ strips!! for the main body of the quilt. Look for the pattern on my website next week and request it in your local quilt shop! I love supporting my local shops and hope you do too! The other two patterns will join this one and make their splash at Market! Stay tuned next week for their big reveal. Did you know that quilt shops are happy to special order items for you? (Now, fabric is tougher to special order and might not be do-able). BUT, how amazing to support your shop and get exactly what you are looking for. AND, I bet they would like to hear the classes/ techniques you and your friends are interested in. I know many (MOST) are gearing up for this year’s Row by Row H2O! #2 – Support your local Quilt Shops! Shop often! We need to keep them and they need our support! Yes, I have added a lot of exclamation points. This industry is thriving and with every quilter’s support we can keep it going! This entry was posted in Brilliant Bindings, Jelly Rolls, Tips, Uncategorized. Bookmark the permalink.